In 1725, the early workhouse directory, An Account of Several Workhouses..., noted the existence of workhouses at Fobbing and Grays (Thurrock). A parliamentary report of 1777 recorded parish workhouses in operation at Aveley (for up to 40 inmates), Corringham (20), Stanford le Hope (20), and "Thorock Grays" (10). The report made no mention of the Fobbing workhouse. County of Essex: Aveley, Bulphan, Chadwell St Mary's, Corringham, Fobbing, Horndon-on-the-Hill, Langdon Hills, Mucking, North Ockendon, South Ockendon, Orsett (3), Stanford-le-Hope, Stifford, Grays Thurrock (2), Little Thurrock, West Thurrock, East Tilbury, West Tilbury. Later Addition: Canvey Island (1837-80). The population falling within the Union at the 1831 census had been 8,609 with parishes ranging in size from Chadwell St Mary's (population 130) to Orsett itself (1,274). The average annual poor-rate expenditure for the period 1833-35 had been £5,897 or 13s.8d. per head of the population. Orsett Union workhouse was built in 1837 at a cost of £3,115. It was designed by Sampson Kempthorne and was based on his 200-pauper layout. This comprised an administrative block at the front with a cruciform layout to the rear but without the central supervisory hub which featured in larger designs. 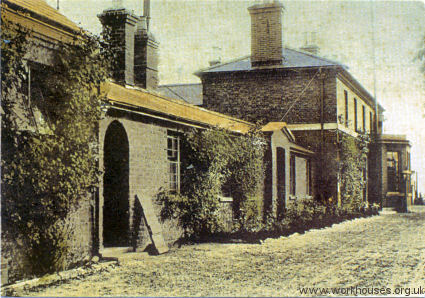 Orsett workhouse entrance block from the north-east, c.1920. Orsett workhouse site from the south-east, c.1920. Fever wards, vagrant wards and workshops were added in 1848, and a women's infirmary in 1911. The much altered layout is shown on the OS 1920 map below by which time the workhouse was known as Orsett Poor Law Institution. From 1917 the Essex Vagrancy Committee ordered that only 'ill' people were to be admitted, and it became known as the Orsett Lodge Hospital. In the 1960s, the former workhouse buildings were replaced by modern ones and the site is known as Orsett Hospital. The Orsett Union operated a pair of children's cottage at 61-63 Whitehall Road, Little Thurrock. In 1924, each home could accommodate 10 children. Essex Record Office, Wharf Road Chelmsford CM2 6YT. Few records survive — holdings include: Guardians' minutes (1835-1930); Relief order books (1911-32); etc.